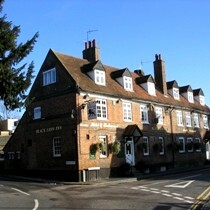 The Black Lion in St Albans is a large corner pub in St Michaels village at the foot of Fishpool Street. Slightly disappointing selection of real ales at the time of the visit with only McMullans AK and Adnams Broadside being available. The pub was quite busy (around 9pm on a Wed), I guess partly due to the live music on offer. This consisted of a singer with a guitar and sounded quite reasonable. The Black Lion is the only pub in St Michaels that shows football on tv so whether that's a good thing or not is a matter of opinion. What it does mean is that this place is busy when there's a big match on. No evening food was available at the time of our visit and it doesn't appear that this place does evening meals. This is a nice pub with character including low exposed beams and has a good lively atmosphere. Out of the four pubs in St Michaels this one is the least posh and has the most dedicated drinkers. Update Dec 2007: Re-opened in November 2007 following extensive refurbishment. Now a Savanna fine dining and cocktail bar so doubtful whether they still serve real ale. Doesn't sound like the sort of place for traditional drinkers to pop in for a beer or two. Now serving Timothy Taylor Landlord. Application approved to convert pub to flats. Pub still open.